I vividly remember the day on which I saw Rev. Fr. Gabriel for the first time in my life. That was in May, 1956, when I entered the Principal's room in the partly built Christ College, with my grand father, for getting admitted to the Pre-University course. I had, of course, heard about Rev. r. Gabriel from the late Shri. C. K. Manilal (eldest son of late Shri. C. R. Kesavan Vaidyar and the elder brother of my friend Dr. C. K. Revi) and a few friends like Dr. C. Sankarankutty (then attached to The Central Marine Fisheries Research Institute, Mandapam Camp, as a Research Fellow) and the late Paliyath Sudhakaran Kuttan (elder brother of the Malayalam play back singer, Jaya Chandran), who had all studied under him at the Sacred Hearts College, Thevara (Kochi). Infact, Shri. Manilal had cautioned me also to be systematic and obedient, if I wanted to study under Rev. Fr. Gabriel. The first impression, in me, too was that the Principal was a no nonsense type strict administrator. I felt that obedience, honesty and a commitment to learning are always the prequirement to any 'Gabrielian' student, for the Father never compromised on these qualities in his students. He knew this very well and sternly believed that if a student does not fulfill these pre-requirements, he can never hope to develop himself. I was very much afraid of Fr. Gabriel and was even scared to talk to him in the beginning. Most of my class mates also had felt like me. But gradually, it dawned upon us that there always was an affectionate and well meaning parent within this tough priest, who always wanted his children to excel every where. We held his fingers and he made us walk on the path of self development. He held us firmly when we fell and praised, cajoled and even reprimanded us, as he taught us to walk on the way to progress. I still do not know how did we change ourselves to fit into his norms and pre-requirements. When he knew we have learnt what was required to be learnt primarily, he let us free to do things in our own way, correcting us on need base. We gradually realized that the tough and strict priest was in realty a very kind man who had kept a great hope and faith in his students. He was right in thinking that if the students go astray, it is the country that goes astray. This was perhaps the reason why he insisted on moral values and discipline amongst his pupils. This great Teacher believes that he could grow in the minds of his students on account of his sincerity in teaching, dedication to his students, his punctuality, effective communication and very frank and honest interaction with his pupil. This was perhaps his greatest achievement in his life. His charisma inspires a great impression in the minds of his students and none who had been his student can ever forget this disciplined and loving teacher. In a particular context Prof. John Cyriac (2005), has very nicely brought out how Fr. Gabriel visualized his 'pedagogic ministry' when he said: "By the Grace of God, I could become a good teacher, sincere and honest and could grow in the minds of my students and to help them to grow up with clear in life." Any one who knows Rev. Fr. Gabriel very closely would always feel that he was a born teacher. He always taught something or other to the people around him. He had a peculiar style in teaching as well. He never took things at the face value and his knowledge was never shallow. He analyzed everything and went to the depth of any issue. He always shared the results of such deep studies with his pupil very sincerely and honestly His pupil, therefore, understood very correctly what he wanted to convey to them. We used to feel that he was a very good friend and guide to every pupil, irrespective of their background or status. At times, we have felt that he seemed more happy and relaxed with his 'children'. Often this could be a respite for him from his very busy and tight daily schedules. But, also he knew equally well to become a stiff task master, if the circumstances warranted so. He goes at times goes out of the way to help and support financially many students, as he strongly felt that "no child should be denied of an opportunity to learn". According to many, who know him closely, Fr. Gabriel faithfully followed the foot steps of Rev. Fr. 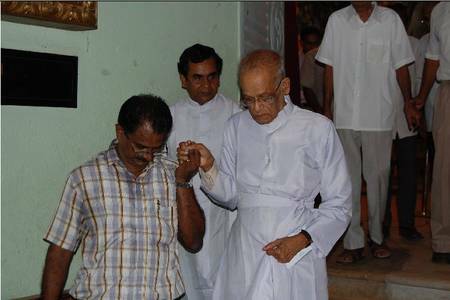 Kuriakose Eliyas Chavara, who was the founding father of the Carmelite Congregation. Rev. Fr. Gabriel knew every one of his students very well and was keen to keep in touch with them all and to learn about their welfare. There are many great physicians, surgeons, bio-scientists, marine biologists, entomologists, fishery scientists and managers in the country and abroad, who owe their knowledge to this great Zoologist-Teacher of our time. He was perhaps one of the very few who has given the maximum technical and scientific human force to the country in the last six and odd decades. The 'teacher' in him was probably woken up as back as 1942, when he entered the field of teaching in the Upper Primary School in Champakkulam (Alappuzha district). The curious and inquisitive infant minds in the school would have had a great impression on him. May be he would have realized that the curiosity to know new things and the thirst for knowledge are acute in the young minds. Their curiosity and inquisitive ego-stage would have influenced him in favor of sharing knowledge in most effective way with them. This (I used to feel) may be the reason why he always treated even his grown up/ very old students also with the same softness and affection, as if they were still the tiny tots of the yester years. As he moved to teach the Aspirants of Priesthood in Mannanam (1943), he appeared to have carried these impressions to a slightly elderly segment, which had a disciplined priesthood as their objective. Yet, teaching is teaching and pupil the pupil. The teacher continued to be the teacher though the pupil and the subjects he taught varied. He again entered the teaching profession at the University level in 1949, when he took the responsibility of the Zoology Department in the Sacred Heart College, Thevara (Kochi). (He was elevated as the professor in 1952). He continued to teach there. Here the subject was his favorite Zoology. He taught Zoology to his many thousand students, some of whom later became very respected Professors, reputed marine biologists, fishery scientists, physicians, surgeons, etc. in reputed organizations / agencies the world over. "I owe all my skill to Gabreil Achan" said the 74 year old Carcinologist who worked as a scientist in different countries abroad. He was an old student of Fr. Gabriel in Thevara and had learned the intricacies of the biology of marine crabs from the teacher. "You have become a great scientist," I told one of my teachers who subsequently had become the Head of a national level Inland Fisheries Research Institute, when we met in Bhopal, during my tenure with the Gujarat Government. "Gabriel Achan's blessings" was his polite reaction. He was a student of Rev. Fr. Gabriel in Thevara. Fr. Gabriel established the Christ College, Irinjalakuda and became its founder principal. Still, he continued to teach Zoology to the Pre-University and B. Sc. Students, as the Professor of Zoology. As his administrative responsibilities increased as the Principal, he entrusted the Zoology Department - which he founded with great love and affection- in the hands of a competent teacher - Prof. M. A. John - in 1961. Even after leaving the Christ College, the Rev. Father continued to teach. The subjects changed from Zoology to ethical and philanthropic issues. And now at the age of 93, Fr. Gabriel teaches Ethics to the students of the Nursing College, he established in the Amala Complex. "One for whom teaching is a passion cannot but continue to teach has been the message of Rev. Fr. Gabriel", observes Prof. John Cyriac (2005). We always feel like agreeing with the learned Professor's observations.